This Semester Start-Up Guide details the process of creating your Webcourses@UCF course section(s). Don’t forget to review the End of Semester Guide to help you conclude your course and submit final grades. All academic courses will be automatically checked for creation ten days prior to the first day of each semester. If you have not met the training requirements for the course mode (i.e. IDL6543 for W and M mode courses), your course(s) will not be automatically created. The Faculty Webcourses Manager (FWM) is a self-service tool that allows faculty to create Webcourses@UCF course section for their classes. The course section is generated within 24 hours and enrolled students are automatically added to the course. Via FWM, faculty may combine multiple course sections and customize the date when a Webcourses@UCF course section opens for students. Sign on to the myUCF Portal with your NID and NID password. In the myUCF Menu, click Faculty/Advisor Self Service. Click Faculty Webcourse Manager. You will see your list of course section(s) for the current term. Note: If you wish to view a different semester, click Select a different term at the top of the page. 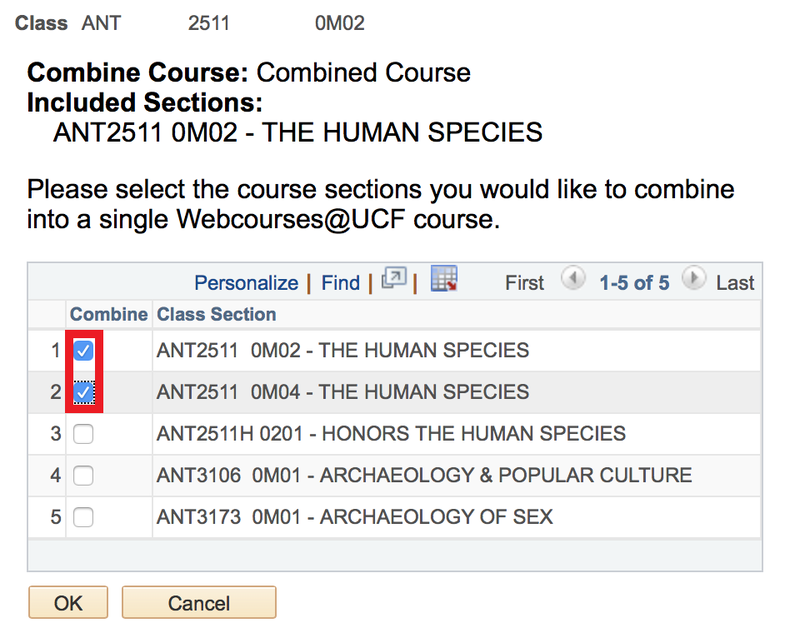 If you wish to create a Webcourses@UCF section, click the box to the left of the section. Wait until the screen refreshes before selecting another course. Note: If your section is already selected and you are co-instructing that course section, please contact your co-instructor before contacting support services as the co-instructor has already created the course. Note: If you do not cross-list (combine) sections or do not teach with lecture capture, then skip to D. Set Release Date. In the Combine Sections column, click one of the sections that you want to combine. Then click the check box to the left of the section(s) you wish to add to combine. Note: You may return to the Faculty Webcourse Manager and separate or add combined sections before the release date. Once students have access to your course, you cannot combine or separate combined sections because the course content and student work will be hidden in the combined course. If you need to combine or separate combined sections after the release date, please contact Webcourses@UCF Support at (407) 823-0407 or webcourses@ucf.edu. Click OK at the bottom of the page to complete your cross-list selection. Return to the main page to view a confirmation message regarding your combined selection(s). Note: If you do not teach with Lecture Capture video, then skip to D. Set Release Date. If you are teaching a course section with a video course mode (V or RV), the check box to the right of the section under Video Lecture Capture will be automatically checked. To select the date your section(s) are released to students, either click on the calendar page to the right of the date field and click on a specific date, or manually edit the date that appears in the Release to Students on column. Click Save at the top or bottom of the page. A confirmation page will appear. Within 24 hours you will have access to your Webcourses@UCF section(s). You will see them in your Courses list at the top of the Canvas Home area. Students are automatically populated as they add and drop courses. Once you Publish the course students will have access to your Webcourses@UCF courses on the date you selected. If you do not set a date, the course will be released to students on the first day of classes for the semester but only after you Publish the course. You may change the date that the course is released to students at any time. If you wish to change the date after students have access, you may change the date in the Faculty Webcourse Manager, and the change will appear within 24 hours. However, students will not have access until the new release date, and they may have questions if a course disappears. The Course Preview feature will show students your course’s Syllabus description from your Webcourses@UCF course section. Once you enable the Course Preview, UCF students who are logged in to the myUCF Class Search will see a View Tentative Class Syllabus link. This link will allow them to view your course’s Syllabus description. Visit the Course Preview Feature page for instructions on how to enable the Course Preview feature. Follow the steps below to Import Content from Another Course if you want to use content from a development course or from the same course taught during a previous semester. You can also find an illustrated guide. Alternatively, Webcourses@UCF Support can create a development course to add the copied content. Which content should be copied. An email of permission/approval from both instructors about this request. Sign in to http://webcourses.ucf.edu with your NID and NID password. Navigate to your newly created course with the Courses tab in the global navigation menu. Click the Settings tab in the course navigation menu. Click the Import Content into this Course button to import content. In the Content Type drop-down menu, select Copy a Canvas Course. In the [Select Course] dropdown menu, choose the course that you wish to copy from or type in the course name. If you do not see your course in the drop-down menu, click the box to select Include Completed Courses. Check off Select migration content if you do not want to copy the entire course. Check off Adjust events and due dates if you want to automatically adjust dates by clicking on the Calendar icon and clicking on the date. You can also use the Substitution option. For example, if you taught a Monday/Wednesday class last semester that falls on Tuesday/Thursday this semester, the Substitution option can adjust this. The Current Jobs menu displays any prior import history, as well as the status of any reports in process. There are various job statuses, as displayed in the image below. Queued or Pre-processing: Your import is being prepared. Running: Your import is currently running. A time remaining bar will also appear. Waiting for select: This status only appears when selecting individual course content. Click the Select Content button to continue the import. Completed: Your import is complete. The Completed status can be green or orange. Green: No issues were found in your import. Orange: One or more errors were found in your import. Click the issues link to view the recorded error(s). Failed: Your import was not completed. To view the specific error(s), click the issues link. The New Gradebook is a new feature that allows instructors to view an improved version of the Gradebook. This feature makes grading more flexible and intuitive and elevates the Gradebook user experience. Follow the steps below to enable the New Gradebook in your course. Navigate to your newly created course within the Courses tab in the global navigation menu. Toggle the New Gradebook option to ON by clicking the button to the right. The New Gradebook has now been enabled in this course. Students cannot access your course until it is published! Unpublished courses will have a notice at the top of the course home page. Until the course is published, this notice will not disappear. Navigate to your unpublished course with the Courses tab in the global navigation menu. Click the Publish button under the Course Status menu to publish your course. A banner will appear at the top of the page to confirm the course has been published. As you teach using Webcourses@UCF, the number of courses you are enrolled in will increase. We suggest that you hide inactive courses to limit the length of your course list. This process does not delete or deny you access to a courses. It simply prevents inactive courses from appearing in the Courses sidebar of the global navigation menu. Log in to http://webcourses.ucf.edu with your NID and NID password. Click the Courses tab in the global navigation menu. Click the star icon next to the course you want to add to your list. Your development sections will contain Dev- in the title to differentiate them from your live sections. Hiding a course in your Courses list will not affect student access. Your course list can display up to twenty courses. Contact your department scheduler to add individuals needing these roles to your course using PeopleSoft. If you do not know who your department scheduler is, please contact your department chair’s office.